Fundamentals of Transportation Engineering 1 Edition Combining topics that are essential in an introductory course with information that is of interest to those who want to know why certain things in transportation are the way they are, the book provides a strong emphasis of the relationship between the phases of a transportation project. 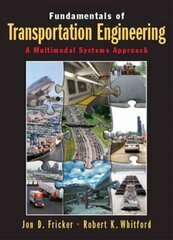 The volume familiarizes readers with the standard terminology and resources involved in transportation engineering, provides realistic scenarios for readers to analyze and offers numerous examples designed to develop problem solving skills. The volume examines transportation basics, traffic flow theory and analysis, highway design for performance, modeling transportation demand and supply, planning and evaluation for decision-making, design of highway for safety, design of intersections for safety and efficiency, pavement design, public mass transportation, air transportation and airports and environmental issues/emerging technologies. For those interested in transportation engineering.